In a world of unprecedented business and market pressures, we recognize that our corporate clients are constantly challenged by having to respond to enhanced productivity, competitive positioning and operational excellence. Our individual clients are concerned about building wealth and preparing for their future. At CPA Consulting Group, we want to simultaneously help with your productivity and gain greater control over your cost structures. A high personal comfort level with your accountant does matter. We take pride in providing top-notch accounting support services to help evolve your business combined with effortless communication skills to build a high comfort level with our clients. We strive to create an environment conducive to learning while serving as a single-point-of-support in helping our clients reach their goals. Blending the roles of accountant, advisor, success coach and advocate, we’ve built a track record for exceeding client expectations. We help you take a long look at what’s behind the numbers– the systems, processes and relationships that form your organization. Beyond having the financial expertise, we offer the best view of your business and strategies for moving you forward. We provide industry knowledge, insight and innovative thinking that surpasses traditional accounting firms. Our team of strong communicators builds client rapport through offering practical solutions on operating more effectively, growing a business and how to achieve new levels of success. We position our clients to make timely, effective and educated decisions. Our counsel is one-on-one, objective, engaging and jargon-free. CPACG strives to be one of Nashville’s leading professional services firms. Our firm’s established reputation was noted in the most recent Nashville Business Journal, as we were recognized as one of the top 25 accounting firms in Nashville. Need a new Nashville CPA for your business, or need a fresh approach to your taxes, you’ve come to the right place. Nashville CPA Consulting Group. 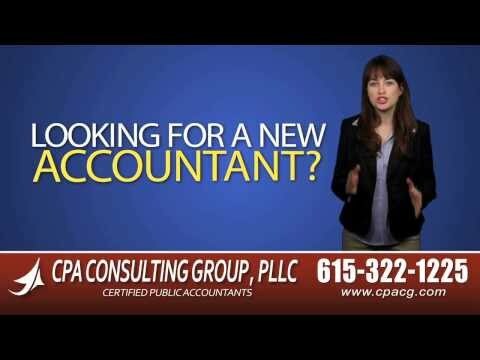 At Nashville CPA Consulting Group, we’re much more than your standard number crunchers… we become part of your team. Sure, we can crunch the numbers with the best of them… but our business insights and tax strategy expertise can help your company thrive. We empower you with knowledge to help you make informed decisions. So if you’re unhappy with your current Nashville CPA or Nashville bookkeeper, need a new approach to your taxes, or just want help crunching the numbers, call us at Nashville CPA Consulting Group for a free phone consultation about your specific needs. Looking to outsource all or part of your company’s accounting and bookkeeping functions? CPA Consulting Group offers a hassle-free way to keep your books up to date while you focus on doing what you do best: run your business. Whether you want your accounting and bookkeeping services performed in your office or in ours, we can help. Questions and troubleshooting on a wide variety of issues, including special compensation, fringe benefits, which forms to update at year-end, bookkeeping related issues, payroll related issues and more.